Osteopathy is a “hands on” therapy based on the theory that some disorders can be alleviated by the treatment of the skeleton and muscles using manipulation and massage. It comes from the Greek words osteon meaning bone and patheia meaning feeling. It literally translates as bone-feeling. An osteopath spends many years training to develop a very fine sense of palpation to enable them to feel and effectively listen via their hands to what is going on in the body. An osteopath is able to identify and recognise body problems via touch and they work with their hands using a wide variety of treatment techniques such as soft tissue massage, stretching, gentle joint movements, and manipulation techniques to enable the body's own healing to take place. Some osteopaths specialise in a technique called cranial osteopathy which is a very gentle technique ideal for babies and children. The Latin word cranium comes from the Greek kranion which means skull. Cranial Osteopathy is a technique that osteopaths use which deals with not just the bones of the skull, but also the very small rhythmic change that exists in all the tissues of the body. This is called the Cranial Rhythm or Involuntary Motion. Any disturbance of this rhythm or motion can cause problems in the body. A cranial osteopath is trained to locate and alleviate any disturbance. Osteopaths believe that a great many infant problems are actually caused by imbalances in the cranium caused during the birth. Please see my next page for a fuller description of what can be treated. Is it like Cranio-Sacral Therapy? Cranio refers to the cranium(skull) and sacral refers to the sacrum which is a triangular bone at the back of the pelvis. Although Cranio-Sacral Therapy may have similarities with Cranial Osteopathy, a Cranio-Sacral therapist is not an Osteopath and therefore does not have the four years of training in anatomy, physiology and pathology that an osteopath has. An Osteopath will have a Bachelor of Science degree in Osteopathy or a Diploma in Osteopathy and will be registered with the General Osteopathic Council (GOsC), and will have a certificate to prove it. 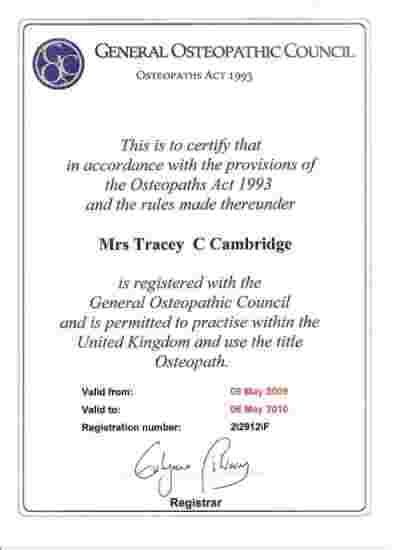 The Osteopaths Act of 1993 means that only those practitioners who can satisfy the requirements of the GOsC will be admitted to its register and will be entitled to call themselves osteopath. This is a measure of basic clinical competence and safety. Chiropractic is the diagnosis and manipulative treatment of the joints, especially of the spine. Chiropractic comes from Greek kheir meaning hand and praktikos meaning practised, experienced. It literally translates as practised with the hands. Chiropractic and Osteopathy share a common history. Doctor Andrew Taylor Still founded Osteopathy in America in 1874. Daniel David Palmer, a former student of Doctor Still, founded Chiropractic 21 years later. Osteopaths and Chiropracters have similar training, treat similar conditions, and can use similar manipulation techniques. However, not all Chiropractors have training in Paediatrics or Cranial techniques; neither do all Osteopaths. Each practioner is an individual with their own special interests. These differences can be as wide as the two schools themselves. Therefore the most important choice for the patient is the experience and training of the practioner. What is a Paediatric Osteopath? A Paediatric Osteopath is an Osteopath who has a Diploma in Paediatric Osteopathy (DPO) or more recently a Master of Science (MSc) from the Foundation for Paediatric Osteopathy. 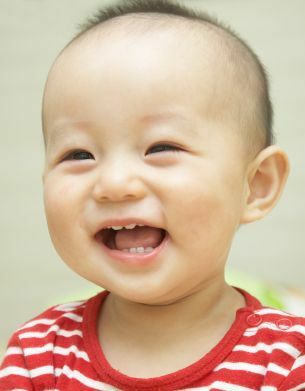 The word paediatric refers to that branch of medicine which deals with the treatment of children. 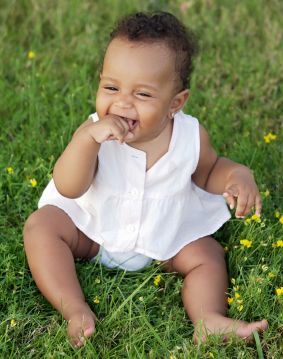 Ideally, every baby should be seen by a Paediatric Osteopath shortly after birth to check for and treat any restrictions or asymmetries in the baby's skull and body that may lead to problems later on, as they grow. I highly recommend the introductory book Osteopathy for Children. You can also directly ask me any question you have using the contact details or enquiry form.